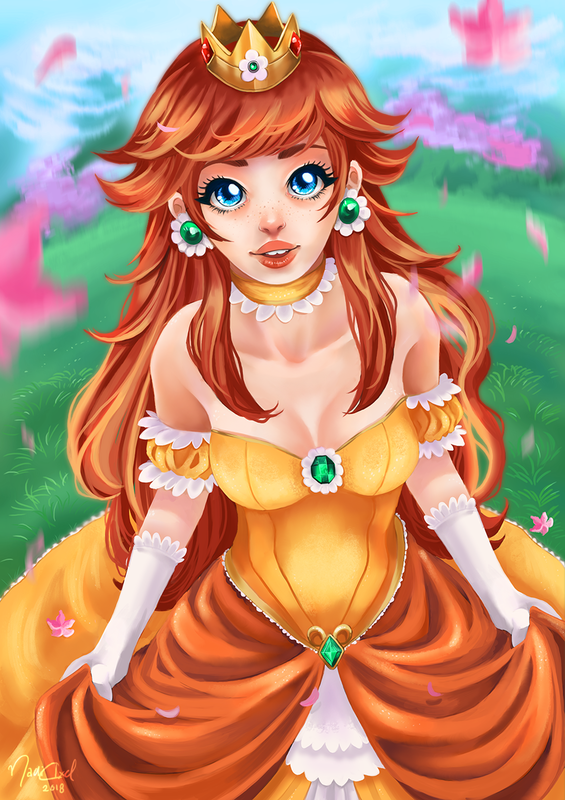 One of my latest commissions was a drawing of the beautiful Princess Daisy. I exported out screenshots of some of the major steps in my digital painting progress and wanted to share them as inspiration to anyone who would find it useful. I usually develop several mockups - especially if the artwork was commissioned or if I have a lot of unclear ideas about the direction of the painting. If the artwork was commissioned I ask my customer to pick a mockup for me to continue with. If I'm just making the painting for myself I usually experiment with some thumbnailing before deciding which mockup to continue with. In few cases I grow too attached to several mockups and I end up developing a little on all of them, turning them into proper sketches, before making a final decision. It is 50:50 whether I decide to do clean lineart or go straight to shading/coloring on top of the sketch. At the moment I'm not focusing so much on cleaning up my sketch after I started painting on top of it, so if I want to make sure the sketch was properly cleaned up I just do lineart instead. I usually create clean lineart when the artwork was commissioned by a customer. In reality it is probably the undecisive 'me' that kind of want to let go of lineart but just loves doing it as well. I use a custom Photoshop brush with transfer to create lineart and I usually pick about 80% black as my tone for lineart. Sometimes I throw in a little hue (fancy word for color) as well. This is probably the least entertaining part of coloring. T H E F L A T S. My latest process is just to have a single layer containing all the flats. I might paint the different colors on each their own layer but once I'm done I merge them together into a single layer named 'flats'. If I want to later, say, select all the hair, I just place myself on the layer containing the flats and use the 'magic wand tool' to select the hair, then I move onto the layer I want to work on while the selection is still active. I used to keep the flat layers seperate and then shade each individually using clipping masks. However I often got lost in the amount of layers that piled up so I eliminated the amount by merging the flat layers together. 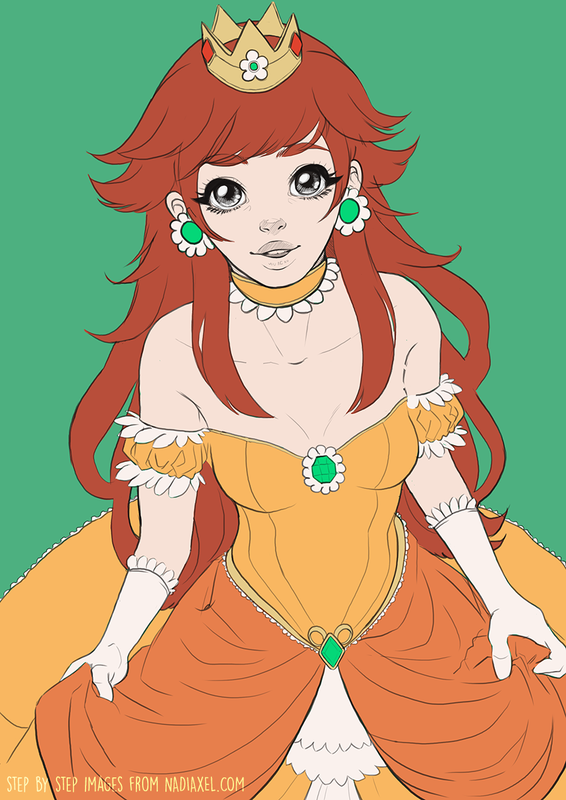 The lineart layer is on top of my layer of flats. I use a standard soft round brush for this step. I select some shades I want to shadows and highlights and make a new layer on top of the flats (still below the lineart layer). The purpose of soft shading is only to indicate where the shadow and highlight areas are. Imagine that all the flat colors are the "midtones" and on this layer I paint in some highlighted areas with ligther tones and some shadow areas with darker tones. TIP: When you select shadow and highlight colors, rebember to slightly shift the hue as well to get some variety into your color scheme. It is finally time to start working on layers above the lineart layer. This means that everything I paint on these layers are going to replace the lineart underneath. This used to be very frightning to me! I could never imagine wanting to work on top of my lineart and (gasp) replace it?! However once I figured out how cool it looks to use contrast in tones and color instead of lines to define features on the characters I got addicted to it. In this step I also color the lineart. I simply make a clipping mask on the lineart layer and start coloring the lines. I use the same brush for shading as lineart, only bigger. It also has a brother-brush which is exactly the same except it doesn't vary in size according to pressure. Those are my main brushes. When I find it hard to blend properly I use a custom brush for the 'smudge tool' to help along. In this step I also changed one of the hands on Daisy because it looked ridiculous. After shading and inital rendering I'm starting to add a little texture as well (mainly using custom texture brushes). It is also time to take a step back and reconsider my choices of color. I, personally, tend to start out too desaturated (it looks muddy) and turn up the saturation later in the process. I also adjust the overall light setting in this step using adjustment layers in Photoshop. When I am satisfied I move on to the final corrections. 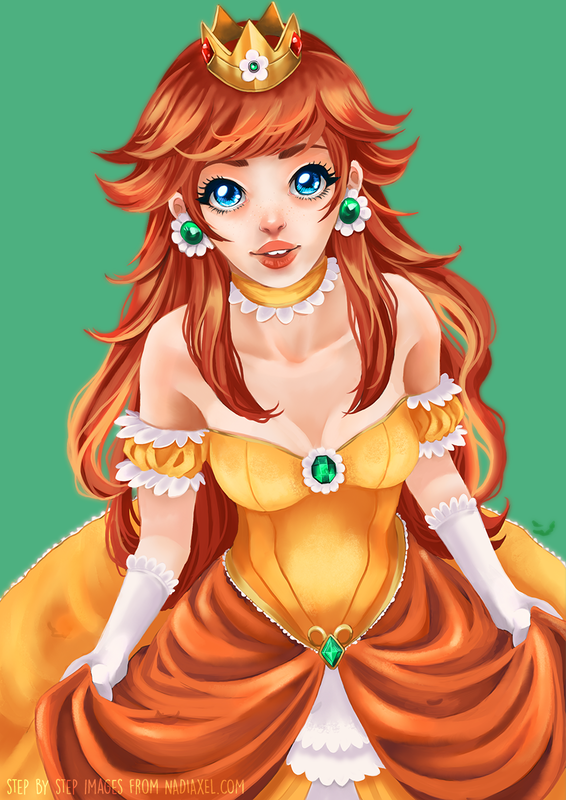 During final corrections of this piece, I noticed that the left shoulder (Daisy's right) looked weird compared to the other shoulder. It worked on the mockup - perhaps even on the lineart, but once I started throwing in colors it became clear there was something wrong, so I corrected it. Sometimes we just don't see it because we work on the drawing for too long. Once I tell myself that the painting is finished, I wait until the next morning to post it because in 90% of the cases there is some small adjustments that I want to make. I simply cannot see the small mistakes because I've been staring at the painting for hours. And finally I add a background! As I had predicted, the following morning after I had declared the painting "done", there was some minor adjustments including making her face a little shorter and narrowing the neck. This was an overview of my painting progress. I hope you find it useful.